Bags, shoes, and leather accessories at 30-70% off. Shoes that were $350-725 will be $75-298. Items start at $10+. 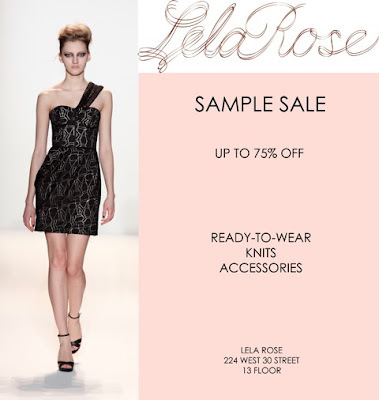 Starting Wednesday, the Lela Rose showroom will be hosting a sample sale of knits, RTW, and accessories up to 75% off. Some of YOOX.com's fall-winter are now 40% off, and shipping is free! Endless.com has started their online promo as well. Not bad too. And if you use ebates.com, you'll even get 7.5% cashback! Until tomorrow night (Monday, Nov 29), KateSpade.com sale items are an additional 15% off with code "CYBER25". Inhabit NY cashmere and cotton at 30% off. Although they use the words "site-wide" and "everything" (on their facebook page), the fine print says the discount is not applicable on sale merchandise. Mmm hmm, so much for 'everything'. Use code "THANKS" until Monday, Nov 29. Ok, I have to do a PSA now: DO NOT SHOP YOURSELF BROKE THIS WEEKEND. Why would I say such a thing? Because there's a one-day Brian Atwood sample sale coming to town. On my birthday. While I will be in Barcelona. Sob!!! If ever there was a reason to cancel a vacation, this is mighty close. Prices will be 30-60% off. Please go girls, and tell me that it's a horrible terrible sale!! To celebrate the U.S.'s Black Friday shopping-mania, TheOutnet.com is offering free shipping to anywhere through the weekend! 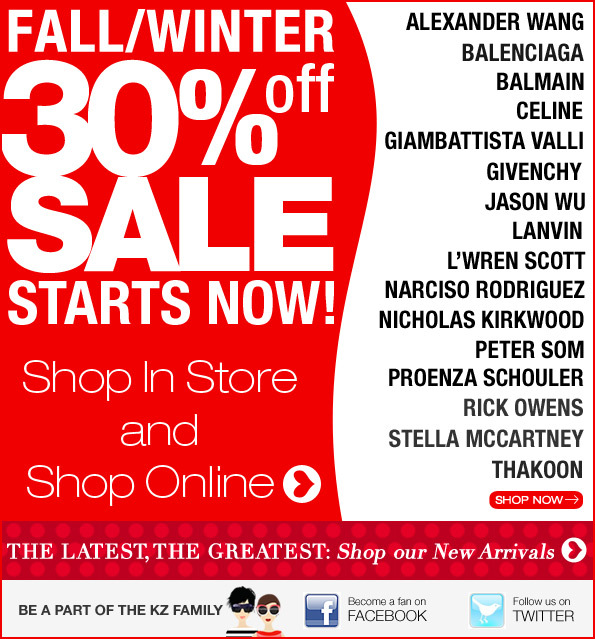 In-store and online, Kirna Zabete's 30% off winter sale has begun! Today only, online only. Use code "LOVEKIKI". And Happy Thanksgiving!! Why wait? Ella Moss kicks off it's sale with 30% off during friends and family. Use code "FFHOL2010". Ends Monday, Nov 29. I'm confused, I thought it had started already? Oh well. Happy Thanksgiving!!! ShopBop is offering discounts for dollars. A very good deal if you need $1,500 worth of new goodies, and this works even on the sale merchandise. 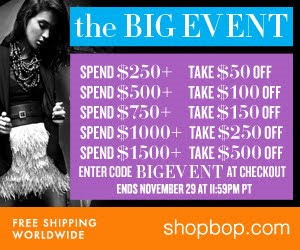 Use code "BIGEVENT" through Monday, Nov 29. Online. Free shipping for $150+. Such a cute little postcard. Use code "STAR" for 25% off today only at TinaTang.com. You'll even get a free jewelry roll for purchases $200+. Get your holiday shopping started with a 10% off code from YOOX. Use code "PLAY@YOOXMAS" which they say good on "their entire catalogue" but I have no idea what that means. I assume it's good throughout the whole website, but if anyone runs into any issues, let me know! 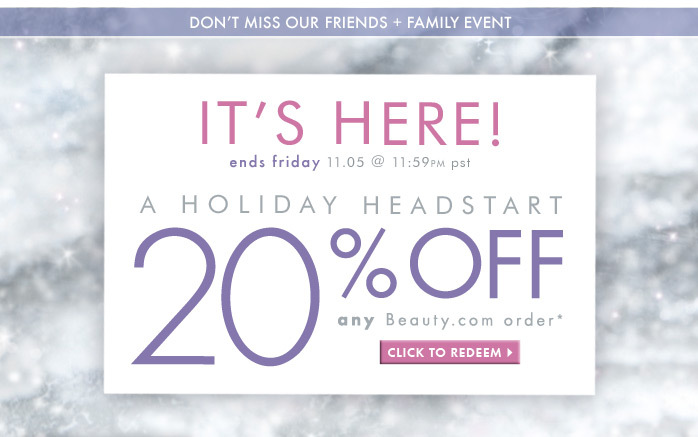 Ends Friday, Dec 3. Ending today, BareNecessities.com has some pretty good prices on La Perla bras, Nation Ltd. tops, and Wolford tights! Today's Groupon deal is quite a gem: a $50 gift certificate to Nordstrom Rack for only $25! Including Burberry Prorsum. Need I say more? Barney's does a cut. 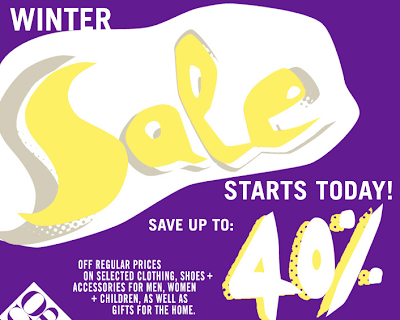 Up to 40% off their Winter Sale. Not a sale, but as someone obsessed with designer pet goods, I wanted to pass this along! (My dog has a pink check Burberry collar and leash which is ADORABLE, and my cats are kitted out with Prada collars, so I can say I definitely support such capriciousness!). 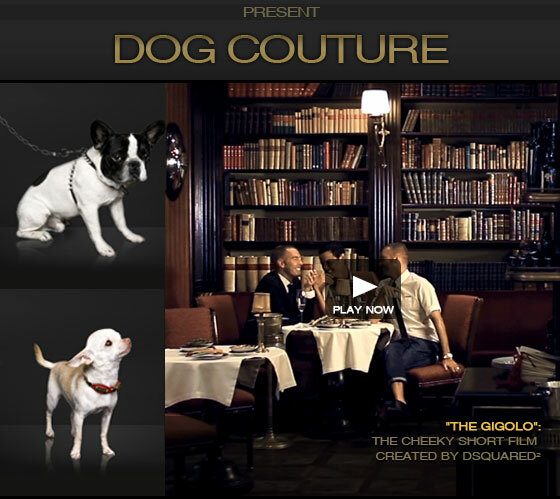 Check out the very edgy Dsquared dog collars which are currently only available on YOOX. Two days only, NM is taking an extra 25-40% off their online sale items. If you need a new winter coat like my friend Jessica, you should pay attention to this. Mackage is hosting another annual *cash-only* mens and womens sample sale right before Thanksgiving, so you should give this a shot before you hustle over to Woodbury Common! 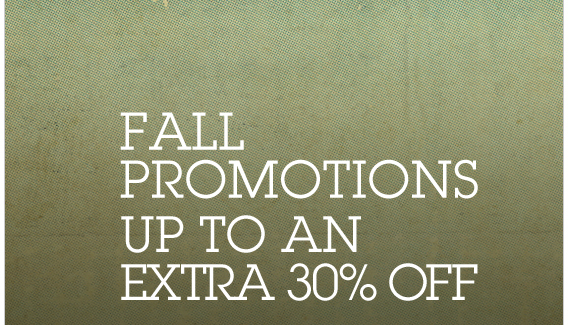 Prices will be 30-50% off, and I've heard pretty positive things about this sale in the past. Now through Sunday, Nov 15, take 20% off RestorationHardware.com, catalog purchases, or even in-stores (you may need their mailer, but I'm not sure). Use code "FFP2010" to shop online and by catalog. The discount also works in their Baby & Child store! A special code for readers. Take 25% off all of BlueBee.com, even the sale! Use code "AFF25". Good for at least the the next few weeks. A new round of sale items at NM! 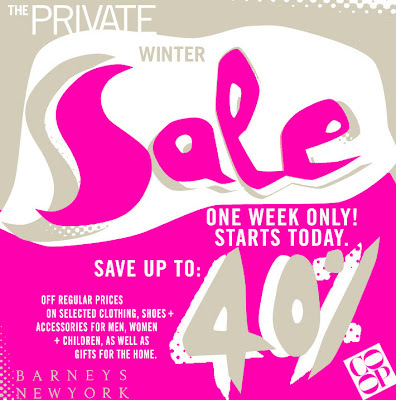 Tomorrow at noon (the flyer is wrong), check your email for a link to TheOutnet.com's F&F sale. They'll have goodies 80-85% off, accessible only via the link. Be warned: if you find something you like, CHECK OUT IMMEDIATELY. The items go so fast. Sign up for an account to get the email. Good news for those of us who need comfy cotton basics or baby gifts... Gabay's (the reseller/consolidator) is hosting a Petit Bateau sample sale starting tomorrow. 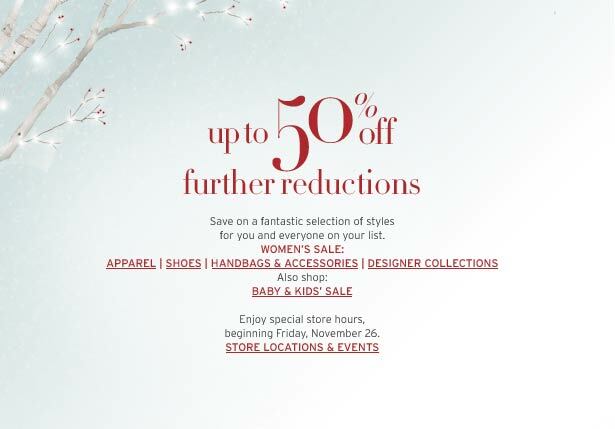 They will be liquidating large quantities of Womens and Childrens clothing from Petit Bateau at 50-60% off. And (this is cute and funny) if you spend $200+, they will reimburse your cab fare there (you'll need a receipt). Perhaps I was too quick to criticize Sephora for not telling me their F&F was going on. I still don't think so, but... I'll let them make it up to me. And I think they are making a good effort. From Thursday, Nov 11 - Monday, Nov 15, VIBs will be able to take 20% off everything they buy online and in stores. Not that I particularly prefer to shop in Sephora stores which are total mayhem, but from what I hear, quite a few people do, so this should make them happy! 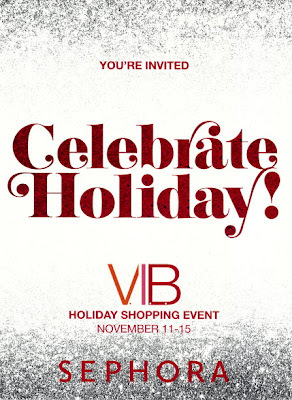 To shop online, use code "VIB20", and to shop in-stores, you will need to bring the invitation they sent you in the mail. I'm pretty sure you have to have it. If you are not a VIB, but have a friend who is, you can go shopping with them together Thursday night, Nov 11, from 6-9PM and get the discount. For those of us not in LA, there's an online sample sale sale. Free shipping for $200+. Ends Thursday, Nov 11. 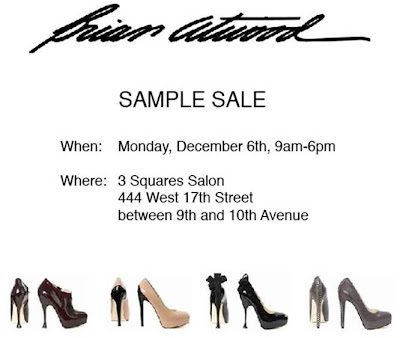 AEFFE, which manages labels such as Alberta Ferretti, Philosophy di Alberta Ferretti, Jean Paul Gaultier, and Moschino, is having a big sample sale. Prices will be about 70% off retail. Sample price points: Philosophy di Alberta Ferretti cream crepe-de-chine floral-print dress $286 (retail $895), Alberta Ferretti red sleeveless dress $409 (retail $1,226), and Moschino leopard-print shift dress $565 (retail $1,625). If you like to buy luxe pressies for your friends (or yourself), have a peek at TheOutnet.com's holiday shop. Lots of cute small items at lower price points, and they'll be adding things every week. First cut up to 40% off online (and in some stores as well). Note to Saks cardholders: it's also triple-points right now! Bloomie's would like to entice you to start your Christmas shopping early! Today through Sunday, Nov 14, use code "GIFT" to take 20% off your online purchase. Print out the email to shop F&F in-stores starting Wednesday, Nov 10th. P.S. they are also offering a $100 giftcard with $500 purchase. Gift card must be used from Nov 15-28 on a $250+ purchase. Another one of my favorites... Vivienne Tam! Wow, between this and Catherine Malandrino and Sferra, I wonder if I will get much work done later this week?!? Starting today, the MCM sample sale. Up to 70% off handbags, clutches, and accessories. They will be restocking. Cash or CC only. No small children or strollers. Craziness will ensue, as it aways does. Mark your calendars! I think 20% is good enough for me to start looking at sweaters. And if you're in the market for a leather coat, you should definitely take a look. If you're loyal to Nordstrom, then now's the time to pop over. They have a very impressive list of labels (Burberry, Blumarine, RED Valentino, J Brand, Alexander Wang, M Missoni to name a few) and prices are 40% off. Shipping is free for $100 and if you have a Nordie's card, they are doing double points too. See? Now you are totally out of excuses. 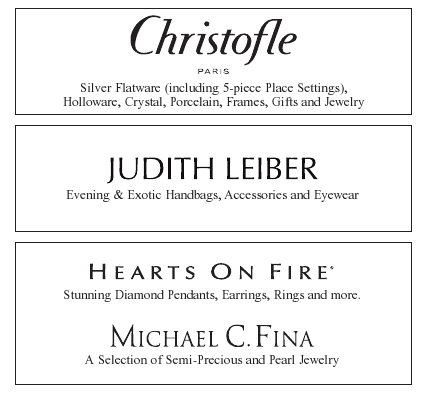 Christofle is having their sample sale, and this time they're teaming up with Judith Leiber and Michael Fina. So expect to find Christofle's fine silver pieces, flatware, and crystal, Judith Leiber bags, accessories and eyewear, and fine diamond jewelry from Michael C. Fina and Hearts On Fire. In other words, a sparkly good time to get some bling for the company Christmas party. If you didn't find anything you liked at Sephora, now you can give Beauty.com a try. Go through the link below today through Friday, Nov 5 and you'll get 20% off your purchase (except Jane Iredale products). 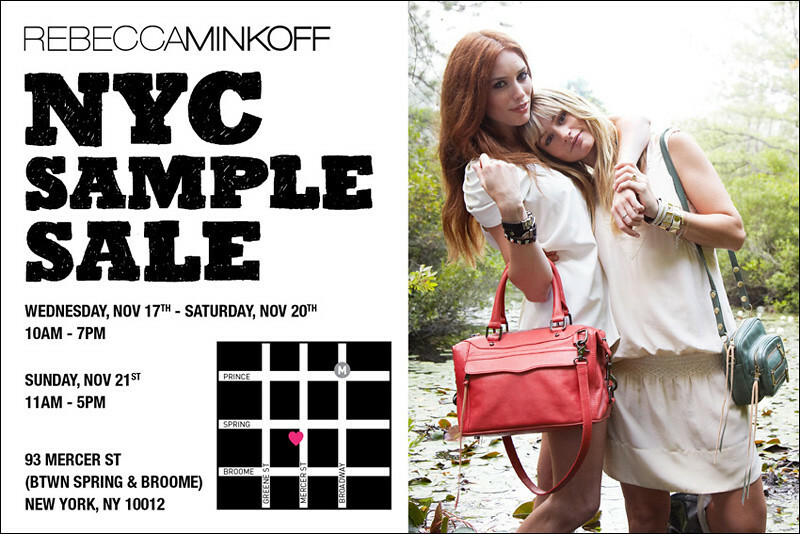 I think November should just be called the Sample Sale month. 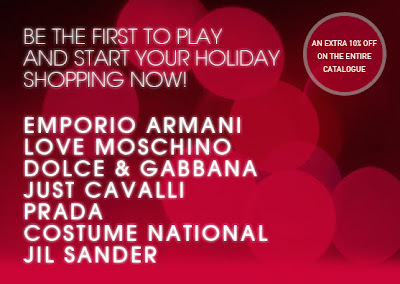 The ESCADA sale, with its huge selection of items, is here again. Dresses, gowns, shoes, handbags, tops, bottoms and others up to 95% off retail. Restocking daily. No strollers or children under 12 please. For those of us who need jewelry. John Hardy's private sale will have sterling silver, enamel, yellow gold, gemstones, and diamond pave pieces up to 60% off. For men and women! Dear girls: here's a knock-down-drag-out cash-only shoe-fest. Love, NYC. The Butter, Tibi, Bettye Muller & Something Bleu are joining forces for a big clear-out shoe sale. Prices will be pretty ridiculous for boots, flats, peep-toes and platforms that retail for $250-$650. Sample shoes $60, sample boots $100, overstock shoes $100, overstock boots $200. And remember, cash-only. P.S. if you print out the TopButton sale posting, you get $20 off when you buy 2+ pairs. I've been sitting on this, but now I need to post it! Time to think about dresses for all the weddings, graduations, bar/bat mitzvahs, and charity functions you'll be attending next year. For those eagerly awaiting this sale, it's finally here. The Andrew Marc sample sale will include womens, girls (sizes 4-14), and mens leather/fabric outerwear and leather/business/travel bags. Prices up to 65% off. I am sure going to be broke this month. Catherine Malandrino's sample sale is coming, and they are piling on the incentives. Items will include her standard FW collection as well as items from her Runway collection (first time ever). 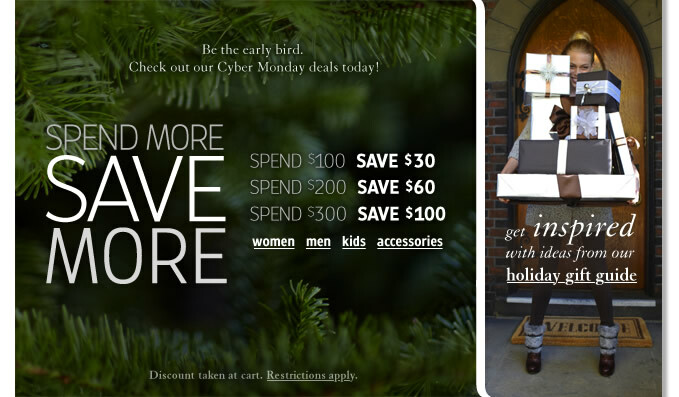 * Score a giftcard to the retail boutique when you spend $250 ($25 giftcard), $500 ($75 giftcard), or $1000 ($125 giftcard). Although my super speedy brain is saying, if you're spending $1000, it seems more worth it to break it up into 2 $500 purchases to get $150 of giftcard vs $125. Labels: Catherine Malandrino, sample sale, Savvy and Co.
Lucky LA ducks! Ella Moss and Splendid are hosting their annual blow-out warehouse sale later this month. They'll carry Splendid, Ella Moss, Splendid Mills, Ella Moss Girl, Splendid Girl, Little Ella and Splendid Littles! Restocking daily. One of my must-read Bloggers, Vie Society, recently posted a fantastic list of sample sales to tPF, which I am re-posting here. I love her posts, esp the ones about her newest shoes or the food she eats. (I would LOVE to post pics of the food I eat, for example we just went to Marc Forgione (inspired by Next Iron Chef) and the food was surprisingly tremendously wonderful and he himself seemed like such a nice guy-- I highly recommend it, esp the tartare!!). * ZYNC cardmembers get in early both days starting 10AM. You can also buy a two-day shopping pass for $50.